At the Region is an ongoing feature that discusses the state-by-state training, certification and employment requirements of first responder departments across the nation. 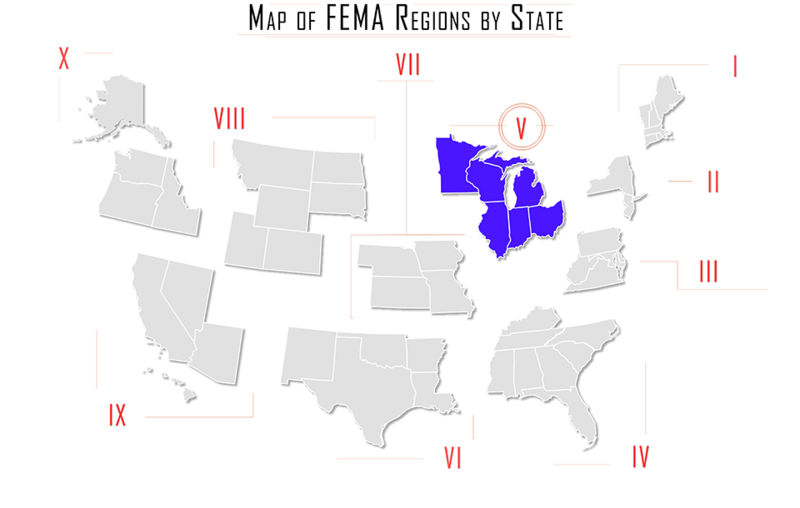 In this issue, At the Region looks at requirements in FEMA Region V: Illinois, Indiana, Ohio, Michigan, Minnesota, and Wisconsin. The Illinois Law Enforcement Training and Standards Board (ILETSB) is the state agency mandated to promote and maintain a high level of professional standards for law enforcement and correctional officers. The board certifies and licenses personnel who have acquired the levels of education, training, and experience necessary to perform the duties of law enforcement. The Illinois Police Training Act, 50 ILCS 705/1 requires that new law enforcement officer candidates must be at least 21 years of age, possess a high school diploma or equivalent, complete basic police recruit training at an academy and pass the Law Enforcement Certification Examination. To complete the certification process, newly employed full-time officers must complete the Law Enforcement Basic Training Course within the first 6 months of hire. All law enforcement officers and county corrections officers must also complete the Mandatory Firearms Training Course. Candidates for the waiver of basic training must first be hired by a bona fide Illinois law enforcement agency. Candidates must meet all applicable Illinois pre-employment standards. Applications for waiver must come from the hiring agency. Documents regarding prior training and experience must be submitted to the Illinois Law Enforcement Training and Standards Board by the hiring agency. Candidates will be required to attend firearms training and a 40-hour Law for Police course. All waiver candidates must pass a 200-question equivalency exam with a passing score of at least 70%. Failure of the exam will necessitate attendance at a full basic academy. Applications for waiver and all documentation must come from the hiring agency. The Standards Board then assesses whether the training and experience are equivalent and whether the candidate is able to waive basic training. NOTE: Board Policy requires the officer to have met a required probationary period (a minimum of 6 (six) months) as a full time law enforcement officer within the state the training was certified. Failure to meet these requirements will cause the waiver to be denied. The Indiana Law Enforcement Training Board is the governing body of the Indiana Law Enforcement Academy and satellite academies. To attend the academy you must be hired by a police department. They will send you to the Academy for basic training. This training must be completed within one year from the date you become a sworn, paid police officer, otherwise you will lose your arrest powers. Candidates must submit a preliminary application if you meet the eligibilty requirements. If the application is approved, you will then be invited to take the written police exam. Tutors and courses are available for better preparation and to assist in passing the required test. After passing the exam, you will be invited for an oral interview with members of the police service in your area. If the oral interview is successful, you will be required to pass a physical agility test that ensures a prospective officer is in proper physical condition to fulfill required duties. After the written exam, in-person interview, and physical agility test, you will then be subject to rigorous testing in various fields. These exams include a polygraph test, background checks, medical and psychological assessments, drug screening and board approval. If you graduated from a police academy in another state, were certified as a police officer, and worked as a paid police officer for at least one year, you may be able to obtain a waiver of basic training. This waiver can only be applied for once you are hired as an officer in Indiana. The recommending police department would then apply on your behalf. Any person trained out-of-state who is hired by an Indiana law enforcement agency must complete a Law Enforcement Training Board-certified 40-hour Pre-basic Course before that person is empowered to make an arrest, conduct a search or seizure, or carry a handgun without a permit. Completion of a certified Pre-basic Course allows a person to function as a police officer for one year from the date of appointment, while awaiting enrollment in a full 600-hour basic training course or while completing the requirements for a waiver of basic training. Completion of the waiver process takes about three months, including a total of six non-consecutive days of exams at the Indiana Law Enforcement Academy. Failure to complete the process before the first anniversary date as a sworn Indiana officer results in the loss of police powers. Click here for more details. The Ohio Peace Officer Training Commission approves and monitors about 60 schools throughout the state that offer peace officer basic training. As of January 1, 2014, the required number of hours for successful completion of peace officer basic training is 585. • Student must be appointed to a peace officer position with a city, village, township or other agency wherein the person is required to complete peace officer basic training. • The student must apply directly to the school. The school commander will provide instructions on how to apply and what is required by that school. • The student must attend the minimum 585 hours and any additional hours added by the school. If the student meets all success criteria for the program, which includes completion of the state certification examination, the commander will recommend to the Commission that the student be issued a certificate of completion of basic training. Students who are not appointed to a peace officer position can attend peace officer basic training on their own time at their own expense. Ohio calls these open enrollment students. Students who complete open enrollment will be issued a letter of completion. This letter can be used by these students to market themselves to an agency selling the fact that the agency will not incur any training expense on the basic training level. • A certificate of completion will be awarded provided no additional training requirements have been mandated. • The person will be required to attend an OPOTC-approved refresher course before the person may perform the functions of a peace officer. • The person must repeat the peace officer basic training course before the person may perform the functions of a peace officer. Open enrollment students must contact the training school directly to determine if that school will accept open enrollment students. The school commander will provide information on how to apply. There is a physical training requirement for the basic training academy. The requirements can be found here. Officers who are appointed to a peace officer position in Ohio and have completed training or education in another state, the military or under the auspices of any other certifying entity other than the Ohio Peace Officer Training Commission, may apply to the Commission for a prior equivalent training analysis. The appointing agency must submit the request in writing. This is only done for appointed peace officers in the state. It will not be done for those who are thinking about relocating to the state. • A detailed breakdown of topics and hours completed in basic training. • Agency in-service training records and advanced training certificates may accompany the request for prior training. The prior training will be compared to the curriculum currently required in Ohio. • In cases where the prior training is deemed equivalent, credit will be given. In cases where the prior training either differs, is insufficient or is non-existent, hours from the Ohio curriculum will be assigned. The student may take the prior equivalent determination to any approved basic training school and apply to attend. The student must provide a copy of the determination to the school commander who will inform the student of the schedule and when the student must attend training sessions. Upon completion of the hours assigned in the determination, the student must take and pass the comprehensive state certification examination. When the school is complete and the commander submits the final records, the prior equivalent student will be issued a certificate of completion of peace officer basic training. The number of required hours varies for prior equivalent students. It is therefore impossible to approximate how much training will be required. Clear documentation of all hours of prior training will be helpful in making an appropriate determination of equivalency. Ohio has a document containing this information and it can be accessed here. The Michigan Commission on Law Enforcement Standards (MCOLES) serves the people of the state of Michigan by ensuring public safety and supporting the criminal justice community. The commission sets professional standards in education, selection, employment, licensing, license revocation, and funding in law enforcement and criminal justice, in both the public and private sectors. • High school diploma or GED is the minimum for an employed recruit. Pre-service recruits must have a minimum of an associate’s degree upon completion of the basic training academy. • A college degree from an accredited institution is evidence of complying with the minimum standard. • No prior felony convictions. Includes expunged convictions. MCOLES publishes a document called “Employment Standards for Michigan Law Enforcement Officers” that contains more details on the state standards. A limited group of individuals who have previous law enforcement training and/or experience may seek eligibility for Michigan Law Enforcement Licensure through the Recognition of Prior Training and Experience Program. A waiver of mandatory basic police training may be granted to a person who was previously a police officer in Michigan, another state, or to a Michigan pre-service candidate who is seeking additional years of eligibility. Out-of-state candidate applications for Recognition of Prior Training and Experience Program will not be accepted unless the candidate has completed at least one year of full-time, fully empowered, paid police service following his/her police training. Applications can be filled out online, and more information can be found here. The Minnesota Board of Peace Officer Standards and Training (POST) establishes law enforcement licensing and training requirements, and set standards for law enforcement agencies and officers in Minnesota. The procedure for becoming a peace officer in Minnesota has three basic components. The candidate must complete pre-service education and training. The candidate must apply for and pass the Peace Officer Licensing Exam or the Reciprocity Licensing Examination to become eligible to be licensed. The candidate must meet the peace officer selection standards (established by POST Board rule) and be appointed by a law enforcement agency. • Possess a valid Minnesota driver's license; or in case of residency therein, a valid driver's license from a contiguous state; or eligibility to obtain either license. • Complete a comprehensive written application. • Submit to a thorough background search, including searches by local, state, and federal agencies, to disclose the existence of any criminal record or conduct which would adversely affect the performance by the applicant of peace officer duties. • The applicant must not be required to register as a predatory offender under Minnesota Statutes, section 243.166 or 243.167. • of any of the crimes listed in this item in another state or federal jurisdiction, or under a local ordinance that would be a conviction if committed in Minnesota. • Five years active service experience in a military law enforcement occupational specialty. • Three years active service experience in a military law enforcement occupation specialty combined with the completion of a two-year or more degree from a regionally accredited postsecondary education institution. • Five years cumulative experience as a full-time peace officer in another state combined with active service experience in a military law enforcement occupational specialty. The only way to find out for sure if you are eligible is to submit an application for reciprocity. You may print the appropriate application and mail it to POST with the requested documentation and non-refundable fee. This application cannot be submitted by fax or e-mail. Alternately, you may contact the POST board either by phone or e-mail to request that an application be mailed to you. Make sure you choose the appropriate reciprocity application: one is for out-of-state/federal government law enforcement; and the other is for military police experience. Each application and the appropriate memo should enable you to determine whether you are eligible or not, but POST needs to have a signed application, fee, and supporting documentation to make a final determination. The Wisconsin Law Enforcement Standards Board (LESB) is the certifying authority for law enforcement officers in the state. • Meet minimum employment standards set by the Board. • Be employed as an officer with an agency. Employing agencies submit form DJ-LE-303, the Verification of Employment Standards and Application for Certification form, electronically to the Bureau along with applicant fingerprints immediately upon hiring a new officer, and prior to that officer’s first date of employment. • Successfully complete the required preparatory training for each applicable certification. The 520 hour preparatory course is specifically designed for potential law enforcement officers in need of meeting Wisconsin certification requirements. Training is delivered through a combination of lecture, multi-media, interactive group discussion and hands-on instruction. Some training will take place outdoors and in the evening hours to simulate actual conditions. The training instructors are a combination of full-time educators, law enforcement officers, supervisors, and administrators who are recognized as leaders in law enforcement training. Only 24 recruits will be accepted in each academy. The preparatory courses are offered at numerous institutions throughout the state. Course locations and dates can be found here. • Be at least 18 years old (some agencies also have caps on how old you can be at the time of application). • Be a United States citizen. • Have received a diploma from an accredited U.S. high school or an equivalency diploma (GED). • Pass a written exam that evaluates your reading, writing, and reasoning abilities. • Be able to legally possess a firearm. • Undergo an intensive background investigation. This background check is designed to ensure that all successful applicants have demonstrated good judgment and character in the past. • Pass all physical, medical, and psychological evaluations, which will assess your suitability as a Wisconsin peace officer candidate. • Minimum employment requirements for law enforcement and tribal law enforcement officers set forth in Wisconsin Administrative Code Chapter LES 2, and must have gained employment as a law enforcement or tribal law enforcement officer with a Wisconsin law enforcement or tribal law enforcement agency, or must have a conditional offer of law enforcement or tribal law enforcement employment with a Wisconsin law enforcement agency. • Completed preparatory law enforcement officer training in another state (or with the military or federal government) that is similar to Wisconsin’s 520‐hour preparatory law enforcement officer training academy. • Held employment as a certified or licensed law enforcement or tribal law enforcement officer full-time, for a minimum of one (1) year fully empowered and paid for all hours worked, and left certified or licensed law enforcement or tribal law enforcement officer employment voluntarily with a good record and been out of that employment for three (3) years or less. Applicants who meet requirements are permitted to complete the Reciprocity Examination in lieu of the 520-hour preparatory law enforcement officer training academy. The Reciprocity Examination consists of approximately 200 multiple choice questions derived from the 33 topics covered in Wisconsin’s 520-hour preparatory law enforcement officer training academy. To be considered for the Reciprocity Examination, applicants who meet the eligibility requirements may submit the Reciprocity Examination Application Packet to the board. The packet is available on WILENET. Applications will only be considered for those officers who have already gained employment with a Wisconsin law enforcement or tribal law enforcement agency (form DJ-LE-303, the Verification of Employment Standards and Application for Certification form, is on file with the Bureau), and for applicants who have received a conditional offer of employment with a Wisconsin law enforcement or tribal law enforcement agency. Applicants will be notified if they have or have not been approved to take the Reciprocity Examination within 30 days of receipt of the Reciprocity Examination Application Packet. Approved applicants are provided a User Name and Password for the Academy Student Section on WILENET where they may study the student texts in preparation for the exam. Approved applicants are also provided with upcoming test dates (the Reciprocity Examination is offered in January, March, May, July, September, and November). Approved applicants who qualify to complete the Reciprocity Examination must attain a score of 75% or higher. Employed applicants must pass the Reciprocity Examination within their original probationary period of employment, not to exceed 18 months, to be eligible for certification as a Wisconsin law enforcement or tribal law enforcement officer. Applicants with a conditional offer of employment have 18 months from the date on their approval letter to successfully complete the exam and gain a formal offer of employment. If an applicant fails the Reciprocity Examination, one re-test is allowed. A score of less than 75% on the re-test requires completion of Wisconsin’s 520-hour preparatory law enforcement officer training academy. A re-test and/or completion of preparatory training must be successfully completed within the officer’s original probationary period of employment, not to exceed 18 months. Applicants with a conditional offer of employment must pay a Reciprocity Examination fee of $245 (this fee also covers the cost of one re-test if needed). A check made out to the Wisconsin Department of Justice will be accepted on or before the scheduled examination date. There is no cost for employed applicants who successfully complete the Reciprocity Examination. However, if an employed applicant fails the Reciprocity Examination, his or her employing agency will be assessed a $245 fee, which will cover the cost of the initial test and a re-test.